Companies such as Google and Apple have recognized the power of mindfulness to help their employees do their jobs more creatively. Social workers can also improve their effectiveness using this simple practice. Research suggests that mindfulness can be a bridge to creativity, helping people get above and beyond mind-wandering, rote thinking, fear and judgment, burnout, and other buzzkills that stifle the imagination and crush originality. But for many, it's a bridge not taken—not because it's difficult, but rather because it's widely misunderstood. Not only is the concept of mindfulness commonly misinterpreted, but the notion of creativity is equally misconstrued, making it difficult for many to imagine an association between the two. Worse, both words can be enormously intimidating. Getting past the confusion, getting over the timidity and discomfiture, and recognizing the link between these two loaded words can do more than revitalize your social work practice; it can also rejuvenate your attitude about your work. Moreover, your clients will reap the benefits of your mindfulness. The word "creativity" is saddled with two misconceptions. First, it's commonly believed to pertain to acts of artistic expression—painting, writing, or playing a musical instrument, for example. Second, it's widely thought to be a God-given gift, a mysterious and rare quality that's driven by inspiration. How often have you heard someone say, "I'm just not a creative type"? But a creative act doesn't have to be a work of art, nor does one have to have been given a divine gift or to have been touched by a muse to act creatively. Creativity can enliven job performance, and no muse is required; all that's necessary is to pay attention … deeply. A pioneer in mindfulness research, Harvard social psychologist Ellen Langer, PhD, has long championed the idea that creativity is engendered by deep engagement, and that deep engagement is engendered by mindfulness. Hungarian psychologist Mihaly Csikszentmihalyi, PhD, called it "flow," a deeply focused state of attention conducive to creativity. Author of Creativity: Flow and the Psychology of Discovery and Invention, Csikszentmihalyi views creativity as the spark in life that lets humans make meaning and from which they derive their deepest happiness. Although Langer believes that mindfulness can bring out the artist lurking within everyone, she, like Csikszentmihalyi, believes creativity is a quality that can be applied to virtually all activities and that learning to cultivate it can help anyone do whatever they do more creatively. Just as many are intimidated by the word "creativity" and insist it doesn't apply to them, many argue that they can't meditate. Some blame a "monkey brain" and claim to be failures at meditation because their minds wander too much. Apart from the fact that that isn't true—everyone can meditate and everyone's mind wanders—mindfulness can be a form of meditation, but practicing mindfulness doesn't necessarily require practicing meditation. Jon Kabat-Zinn, PhD, author of such books as Mindfulness for Beginners and Wherever You Go There You Are: Mindfulness Meditation in Everyday Life, is another strong believer in the power of mindfulness to boost creativity. Founding executive director of the Center for Mindfulness in Medicine, Health Care, and Society at the University of Massachusetts Medical School and creator of the mindfulness-based stress reduction (MBSR) program, which has helped thousands tame stress, he defines mindfulness as "paying attention in the present moment nonjudgmentally." Mindfulness can take place in any situation and at any time—for example, when eating, walking, or conversing. But most of us do such activities—and often our jobs—as if on autopilot, blind to what's actually happening in the moment. Langer observes that when we are mindless, we're not fully experiencing life and we're rigid in our thinking. In her book, On Becoming an Artist: Reinventing Yourself Through Mindful Creativity, she explains, "Mindfulness is an effortless, simple process that consists of drawing novel distinctions, that is, noticing new things. The more we notice, the more we become aware of how things change depending on the context and perspective from which they are viewed. Mindfulness requires, however, that we give up the fixed ways in which we've learned to look at the world." Creativity and mindfulness, she explains, go hand in hand. "Understanding how to think mindfully is the best way to break through the roadblocks that keep us from developing our creative selves. Then, once we've begun to exercise it, creative expression can be a valuable way to explore these new modes of thinking," she wrote. Research indicates that mindfulness and meditation can boost creativity in a variety of ways. In 2012, for example, the first study indicating a correspondence between mindfulness and creativity found that mindfulness training improves insight problem solving (Ostafin & Kashan, 2012). The same year, another study demonstrated that mindfulness meditation has a specific effect on creativity, producing a state that encourages mental flexibility and divergent thinking (Colzato, Ozturk, & Hommel, 2012). And a recent study of the application of Langer's mindful approach in K–12 classrooms demonstrated that mindfulness results in an increased ability to become aware of novelty, a prerequisite for creativity (Davenport & Pagnini, 2016). What's Social Work Got to Do With Creativity? To appreciate how creativity can help you be a better social worker, think of mindfulness as engagement and creativity as innovation. 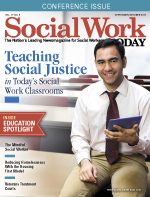 Social workers are problem solvers, which is inherently creative. Learning to enhance and increase engagement and be in the moment with clients increases your ability to innovate. According to Elizabeth Turner, MSW, LICSW, a psychotherapist and founder of the Bodhi Center, a teaching center for mindfulness and other contemplative practices, mindfulness does all that and more. She sees mindfulness as a practice that increases all the qualities one needs to be a good therapist, a view influenced by the work of Daniel Siegel, MD, who, like Kabat-Zinn, is a leading figure in mindfulness education. A clinical professor of psychiatry at the UCLA School of Medicine, he's the founding codirector of the university's Mindful Awareness Research Center and has written widely on mindfulness. Siegel, Turner explains, emphasizes the ways in which mindfulness increases the neural pathways for body regulation, balancing emotion, attunement, modulating fear, having a more flexible mind, and increasing insight. "All these are things you need as a therapist." They're also the underpinnings of secure attachment as well as requisites of creativity. Through mindfulness, she explains, "You become much more aware of your own feelings and emotions, and, when you're with a client, much more attuned to their feelings." Thanks to Kabat-Zinn's great success with MBSR, mindfulness and meditation are so well recognized as stress-busters that many now believe their purpose is essentially to create calm or control the mind. Calm might be an outcome, but it's not the purpose. "It's about bringing your full awareness to whatever is happening at the moment," Turner says. She points to COAL—Siegel's acronym for qualities of mindful attention: curiosity, openness, acceptance, and love. "Each of those words is powerful. When we bring curiosity, it shifts things. We've got dopamine on board and all of a sudden it's interesting." Acceptance is critical, she says, "because we tend to get caught up when things aren't going as we want them to go. When we accept them, things open up. And love takes away fear and anxiety and allows you to be in that open space." Mindfulness is about bringing that kind of attention to all experiences. "If your intention is to get calm or to make yourself more alert, then you're controlling your experience, not accepting it," Turner says. It's not just a tool to bring out of the toolbox but also a practice that influences all aspects of life. "I try to embody mindfulness meditation practice at the core of how I live my life," says Merra Young, MSW, LICSW, LMFT, a psychotherapist and adjunct faculty who teaches MBSR and integrative psychotherapy in Minneapolis/St. Paul. There's no separation, she says, between when she's practicing and when she's not. "It's more a way of living and being than a technique or strategy. Intuition and creativity, she believes, are natural partners. In social work, there's the science, but there's also the art, she observes. "It's so important for social workers, regardless of area or type of social work practice, to develop our capacity to be compassionately present, mindful, [and] aware, and have the ability to meet what's happening more fully and creatively in the moment," Young says. Meredith McEver, LCSW, of A New Perspective, LLC, who teaches MBSR, mindfulness-based cognitive therapy, and a mindfulness-based creativity group, says, "Mindful attitudes or principles continually inform my work, such as being curious and compassionate, turning toward difficulty, accepting what is, knowing that resistance increases suffering, and that our response to an issue is frequently more of a problem than the issue, which is good news because we can work with our response but can't always change the issue. "I am mindful during my therapeutic work with clients and consider it a mindfulness practice just like a mindfulness meditation. For example, in a mindfulness meditation, you might choose to be mindful of breath, and you would pay close attention to the breath in a compassionate manner and, when the mind wanders, go back to the breath. Similarly, when I provide therapy, I might choose to be mindful of my client, and, if my mind wanders, I notice where it went and then redirect my attention back to my client." McEver says it helps her notice when an intervention isn't working and lets her take a fresh approach. "A lot of times I use mindfulness just to center myself before a session, and sometimes I'll start a session with the Tibetan singing bowl," says Tara Arnold, PhD, LCSW, a psychotherapist in private practice who treats clients with mental health and addiction issues. "We'll chime the bowl and give ourselves a few minutes to get grounded, just to still our minds and get in focus. We go from getting there to being there, honoring that it's a transition to that space. That sometimes helps us let go of whatever was going on before the session to be able to focus on the session." Being present in this way can make you more attuned not only to what clients say but also to what they don't say. Kate Kitchen, MSW, RSW, who teaches MBSR and mindfulness-based cognitive therapy as a private practitioner and at Sunnybrook Hospital in Toronto, Ontario, Canada, and teaches individuals who want to lead mindfulness groups, points to times during therapy when she notices that she's holding her breath and she'll have the sense that she "caught" holding her breath from the client. Then, because she may or may not be right, she'll say, "I just realized I really need to take a breath. Would you like to join me?" That, she says, is being mindful. "It helps me attend better to the client so I have a greater understanding from which to create an intervention designed for the client," McEver says. Furthermore, "it helps me to pause and respond rather than immediately react to the situation, allowing more possible solutions to arise." This may be especially true, she says, in difficult situations. "The therapist embodying the mindful attitude of welcoming difficulty can create dramatic shifts in the client's thinking. Because this welcoming is so countercultural, a therapist verbalizing a curious and friendly attitude toward an unpleasant event can gently startle the client into being more curious themselves and lead them out of their habitual way of thinking, giving them a new perspective on the event," she says. Simply noticing, Kitchen says, opens new pathways to new areas. With mindfulness, "you don't have to work at it; it's going to show up on its own." She might notice, for example, how a client is sitting and then sit in the same manner, noticing what it's like to sit as they're sitting and allowing any thoughts to come in response. It's an empathic response that, Kitchen says, "feels like I'm joining them as a way to feel more present." Social workers and their clients can also benefit from the release of judgment that comes with mindfulness. Arnold, for example, points to the freedom that suspension of judgment brings to the therapeutic session. "If you're not worried and overanalyzing and judging, you have more ability to go with your gut in the moment and know what it's saying." Focused attention, she says, lets you gauge your reaction to the client in a much more attuned way, avoid getting stuck in ruts, and "course correct" when necessary. "From that place, it inspires a lot more outside-of-the-box thinking and modalities." That's not to say you won't begin to analyze or judge, but with mindfulness, Kitchen says, you can notice the critical thought, notice that it's not helpful, and not dwell on it. "It takes the pressure off," Young says. "You realize you don't have to know everything, that the most important thing is your presence." She often works with clients who are grieving, for example, and observes that "it's not about fixing and doing," but rather about being open and nonjudgmental. And it's not only the clients who benefit. Mindfulness also helps social workers with self-care, Young says, allowing them to notice when they're getting overwhelmed and recognize signs of burnout earlier. Social workers, Turner says, "deal with extremely difficult things, and mindfulness can help them not feel overloaded." Young believes mindfulness is vital for social workers to help them develop their ability to be compassionately present with clients and meet them with greater awareness and creativity. "It's a core value to meet people where they are," so mindfulness enhances our capacity to be present with a relaxed attention and meet people more from the heart." It's easy, Turner says, to give lip service to meeting clients where they are, but if you don't have the capacity to accept the intensity of their experience, then you can't meet them where they are—you'll be resisting their experience." "To learn to practice mindfulness, you become aware of when the mind wanders and you bring it back to focusing on the breath or the body," Kitchen says. Soon, however, "you quickly notice where the mind is drawn, and you have a decision to make. You can keep following that and wander and every so often bring attention to it, notice where the mind goes, and then bring it back." The mind will always wander, she says, but using mindfulness you notice where it's drawn, and that awareness lets you make conscious decisions about where to focus. "After a while, it begins to come with you through the day, and that, of course, is the whole idea, that it's not just a practice that you do for half an hour," Kitchen says, but it becomes a way of being. As both an artist and a psychotherapist, she applies it to everything she does. To get started, social workers might look for formal training of the type created by Kabat-Zinn. "Being an MBSR and MBCT [mindfulness-based cognitive therapy] teacher, I think the best training for social workers interested in using mindfulness in therapy is a program that teaches mindfulness and includes a curriculum that helps participants explore their own patterned ways of thinking and behaving and helps them become skilled in using mindfulness to deal with their specific issues," McEver says. These programs are also useful if you wish to teach mindfulness and use it as a therapeutic tool. These programs are beneficial for many but aren't required to learn to practice mindfulness yourself and to use it to enhance your professional skills. Arnold began her explorations of mindfulness by reading Eckhart Tolle's The Power of Now: A Guide to Spiritual Enlightenment, and many have learned from the books of Kabat-Zinn, Siegel, and Sharon Salzberg. "Social workers should be able to find good teachers of many different stripes in their communities," notes Turner, who adds that if teachers aren't readily available, there are many resources online as well as mindfulness and meditation apps such as Calm or Headspace. "It's nice, however," Kitchen says, "to be in a group or learn it with someone." Turner, who began her education by listening to audio by renowned teacher Jack Kornfield, PhD, has for 25 years had a group for therapists to meet, meditate, and talk about how they use mindfulness in their lives and in their practices. Mindfulness, Young says, naturally enhances creativity. "When you are mindful, creativity just happens; it just follows," Turner agrees. The openness it engenders, she says, can be a game changer for therapists. Because you're not expecting rigid outcomes, you get less frustrated with yourself and with clients who may not be doing what you want them to do. "The more you develop these qualities in yourself as a therapist, the more you get into a state of cocreativity with the client," Turner says. "It's an order of magnitude more creative than you can be on your own, and the two of you are working together. When you can be in that softer space, things happen. You don't have to follow a strict session plan because the session unfolds." Davenport, C., & Pagnini, F. (2016). Mindful learning: A case study in Langerian mindfulness in schools. Frontiers in Psychology, 7, 1372. Ostafin, B. D., & Kashan, K. T. (2012). Stepping out of history: Mindfulness improves insight problem solving. Consciousness and Cognition, 21(2), 1031-1036.